James McGrath is a Christian theologian and science fiction fan. So, it was only a matter of time before he began contemplating how a truly self-aware robot would respond to human religious beliefs. 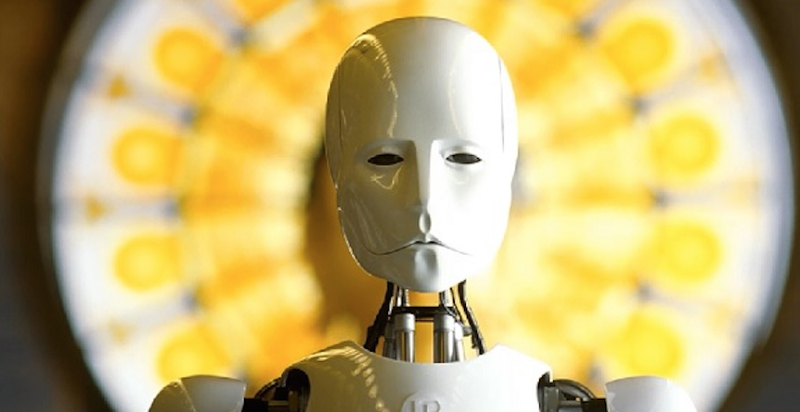 Is artificial intelligence compatible with faith—and, if so, should we worry? It is impossible to know for certain, but just as there would surely be denominations that would see no reason to welcome androids or to accommodate them theologically, there would also be other denominations that would expand their already-existing emphasis on inclusiveness to make room for artificial people, just as they have made room in the past for every conceivable category of human persons. McGrath even ponders the possibility that religious groups might see the benefit in funding the mass-production of androids pre-programmed with inclinations towards particular religious practices, as these could boost the membership levels of one's own faith to the level of "most adherents." If androids are to be capable of religious sentiments and beliefs at all, then the capacity for symbolic as opposed to merely literalistic thinking might prove to be indispensable. Theologians have long expressed key concepts and doctrines through symbols and metaphors. While we might briefly entertain the possibility that super-logical and ultra-literal androids might be enlisted in the service of fundamentalism, such a frightening scenario is extremely unlikely. Although fundamentalists of various sorts claim to believe the whole Bible and take it literally in a consistent manner, none in actual fact do so. In all likelihood, if androids were inclined to be extremely literal, they would quickly discover the selectivity of fundamentalism's self-proclaimed literalism and reject it, although the possibility that they might then go on to seek to enforce all the Biblical legislation in every detail should indeed worry us.